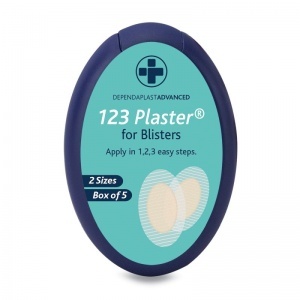 For the effective treatment of blisters, buy the Advanced 123 Blister Plasters to store in first aid kits for the workplace, generally around the house, or to keep in your bag for on-the-go blister care. Supplied with five plasters in each box, these packs are ideal for people that are likely to suffer from blisters, including those working with hot items such as chefs. A blister may form when the skin has been irritated and damaged by friction or rubbing, heat, cold or chemical exposure. Fluid will collect between the upper layer of the skin and the layers below it, which cushions the tissue underneath. This liquid protects the skin tissue from further damage, however can still be quite painful. The Advanced Blister Plasters use hydrocolloid technology to provide optimum healing conditions for the blister, helping it to heal much faster. Each plaster is designed to fully cover the wound to enclose it in a protective environment so that it shields the area from water, dirt and bacteria. 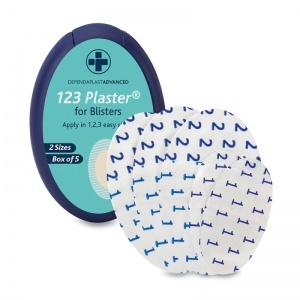 The Advanced 123 Blister Plasters are available to purchase as a minimum of five boxes per order, which includes five plasters of assorted sizes in each pack. They are simple to apply to the skin and stand up to everyday use. The Advanced 123 Blister Plasters are usually dispatched via First Class Royal Mail and delivery should be within 1 to 3 working days.